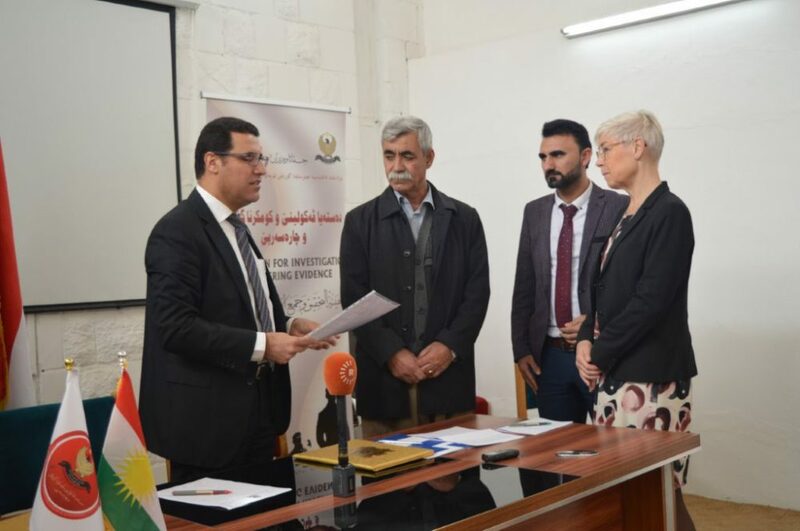 Duhok, 11 February: In an effort to assist in accounting for missing persons from Da’esh crimes, the International Commission on Missing Persons (ICMP) and the Commission for Investigation and Gathering Evidence (CIGE), which has its headquarters in Duhok in the Kurdistan Region of Iraq, today signed an agreement that will give CIGE access to ICMP’s Identification Data Management System (iDMS). The iDMS is a global data system capability that ICMP provides to governments, families of the missing, technical experts and others. It has a set of powerful integrated applications that support the process of storing, processing and analyzing data on missing persons investigations, and identifications. As an estimated one million persons are missing from a variety of circumstances over the last 50 years of Iraq’s history, ICMP’s goal is to ensure access to the iDMS for all Iraqi institutions whose work is relevant to the missing persons process, and to provide families of the missing with the ability to report a missing person through the online capacities of the iDMS. At today’s signing ceremony, ICMP handed over to CIGE a DNA match report identifying the human remains of a Yezidi woman who disappeared as a result of the Da’esh occupation. DNA was extracted from the unidentified human remains and matched with DNA from a blood sample provided by a close relative of the deceased woman. The Medico-Legal Directorate in Duhok collected the sample from the human remains; CIGE collected blood samples from relatives of the victim, and ICMP matched the post-mortem and ante-mortem samples. This was the first DNA-based identification produced under the current Canadian-supported project to safeguard mass graves in liberated areas of Iraq and respond to demands from victims’ families for justice and accountability. The program began in January 2017. Canada has provided funding through ICMP to support all government authorities involved in accounting for those who disappeared after the Da’esh occupation of Mount Sinjar in August 2014. Today’s agreement was signed by the Head of ICMP’s Iraq Program Ms Lena Larsson and the head of CIGE, Investigating Judge Ayman Mostafa. “CIGE is committed to the process of accounting for the missing systematically and efficiently,” Judge Ayman said after the signing. “Working with ICMP we can access the most advanced forensic genetic capabilities. At the same time we can cooperate on developing effective ways of interacting with families of the missing, who are our main priority.”Lena Larsson noted that ICMP has been active in Iraq for over a decade and is working with the authorities throughout the country to help them account for the missing, regardless of their ethnic, religious or national origin, their political background, their role in the conflict, or the era in which they disappeared. 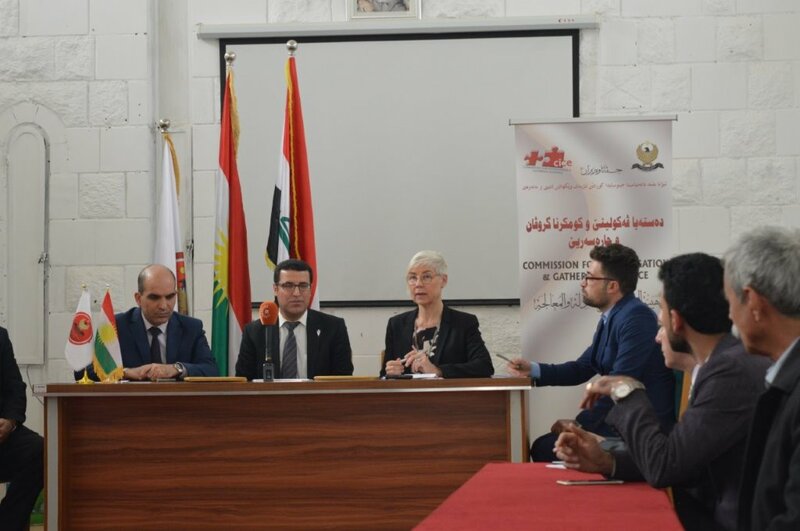 “This project with CIGE will allow us to transfer expertise and technical capacity,” she said, “and at the same time, we hope to work with CIGE on programs that will allow families of the missing to participate fully in the process and to access their rights to truth, justice and reparations.”Also present at today’s signing were Deputy Minister for Martyrs and Anfal Affairs Brfan Hamdi, representing the Kurdistan Regional Government’s Council of Ministers and High Committee of Genocide Recognition. Under today’s agreement, CIGE and ICMP will work together to implement effective data processing and protection mechanisms through the iDMS, and data collection from families of the missing. ICMP will provide CIGE with support in data entry and data analysis through training activities, and will help CIGE to develop and implement Standard Operating Procedures, and chain-of-custody provisions, as well as ensuring the secure archiving of documentation and retention of biological samples.